The semi-finals are over and the 2012 BC Provincial Cup finalists are now known. With five of the eight games being decided by one goal, and two of the games being decided after extra time, it was a weekend of tight and tense action. The ‘Super Saturday’ day of finals at Burnaby Lake West on May 12th is going to be one for all local football fans not to miss. AFTN managed to take in one of the ‘A’ Cup semi-finals and both of the ‘B’ Cup ones, as we continue our “Road To Wembley Burnaby Lake” feature. Having watched West Van defeat Bays United in the first round, and Surrey United Firefighters then defeat West Van in the quarter finals, our ‘A’ tie of the round saw us travelling up to Gates Park in Port Coquitlam for the PoCo FC v Surrey United semi final. It was a closer game than many thought, with Surrey dominating the possession in the first half hour, and looking like they may steamroller the home side if they got the breakthrough, before PoCo fought back, taking the game to the visitors and having the better chances overall in the match. With Surrey in the ascendency, out of nowhere, PoCo had the best chance of the game after 30 minutes, when Paul Shepherd was forced into a good save at his near post. Shepherd was called into action again soon after, having to save twice from Tino Cucca drives. Eight minutes before the half, Surrey’s Colin Streckmann brought out a fantastic one-footed save from PoCo keeper Erman Ozkan at close range. PoCo responded when Milad Rahmati fired into the side netting and the teams went in level at the half. The home side continued to have the better of the game just after the break and Cucca went close three minutes into the second half when his long range drive sailed just over. Surrey then found their groove once again and Jeff Clarke brought a fantastic save out of Ozkan in the 53rd minute, after being set up by a great backheel from Streckmann. Angus Burke had a great chance for Surrey on the hour mark, but was unable to steer his header goalbound and it ended up across goal and into the keeper’s hands. It looked like PoCo had finally broken the deadlock minutes later. Rahmati was sent clear and one on one with Shepherd. The striker lifted the ball over the advancing keeper but it bounced agonisingly off the right hand post. PoCo were to pay for the miss when Jeff Clarke scored the only goal of the game around the 70 minute mark. The former Whitecap was left unmarked in the box as the ball came over from Burke on the left wing and he had all the time in the world to control it, chest it down and coolly slot it past Ozkan from 8 yards out. PoCo nearly levelled in dramatic fashion when a Mark Gomes curling free kick was brilliantly saved by an acrobatic Shepherd. It was a top class save and they came close again late on with a diving header in the box. They couldnt find the breakthrough to take the game to extra time and the game was settled by that one solitary Clarke goal. Having deposed of the number one seeds, Surrey now move on to face fellow VMSL side Delta United Hurricanes in the ‘A’ final, with a 4pm kick off on May 12th. Delta won away to Metro-Ford Wolves on Sunday by a 1-0 scoreline, with the only goal of the game scored by midfielder Cam Hundal. For those that watched the pre-season friendly between Vancouver Whitecaps and UVic in Victoria, Hundal put in an impressive ‘man of the match’ performance for the Vikes. The Whitecaps obviously took note, and he has signed a PDL contract for the Caps for the coming season, which starts on Friday night with a home game against Kitsap Pumas at Swangard Stadium. Surrey will go into the final as favourites, but it should have the makings of a cracking game. As will the ‘B’ Final. Having championed NVFC Campobasso in the tournament so far, we were back in North Van on Sunday afternoon to catch their semi final with Burnaby side Europa FC at Windsor High School. For the second week running, Campobasso fell behind to an early goal from the visiting team. A long ball over the NVFC defence caught the home side flat and allowed Will McKnight to nip in and hit home the opener in the first few minutes of the match. Europa dominated the early proceedings and were looking in control, but, as with last Sunday’s quarter final with Shaheen FC, Campobasso fought back and former Whitecap Dever Orgill was starting to be a handful for the Europa backline, often having two players on him. A spectacular overhead kick from the Jamaican international saw the home side threaten midway through the half and moments later they were back on level terms when the ball fell to Orgill on the edge of the box and he cracked a thunderbolt through a mass of players for the equaliser. It was an unstoppable strike that gave the Europa keeper Dennis Aere no chance and Orgill celebrated with his trademark flips. It wasn’t long before it was two for NVFC. Orgill’s fast footwork saw him brought down in the box for a penalty and he picked himself up to drill the ball down the middle for 2-1 to Campobasso. As the home side pushed for a bit of daylight, Robson Sa had a couple of chances, which were saved by Aere. As half time approached, Europa had a great chance to tie things up at the break, but Sam Dewar shot narrowly wide of the left hand post. Europa came out for the second half like they started the first and looked the most dangerous team for the majority of it. They came within inches of tying it up in the 72nd minute when a scramble in the box saw a clearance ricochet off McKnight and just past the right hand post. As the final whistle approached, the Burnaby league side really went for it and McKnight again came within a fraction of levelling after he was put through, bore down on goal and was inches away to the left this time. Europa kept pushing and their efforts nearly got its reward in stoppage time when a header from a corner flashed just past. The final whistle signalled jubilant scenes from the home team and supporters. I could have easily enjoyed another thirty minutes of the game. NVFC Campobasso now move on to the final, but Europa certainly gave an excellent account of themselves and their League. AFTN writer Steve Pandher also took in the final semi of the weekend, as Richmond All-Blacks took on Surrey FC Coyotes at Minoru Park Oval in Richmond on Sunday evening. It took the Coyotes extra time, but they were eventually able to beat the Richmond All-Blacks 4-2. For the second straight week the FVSL side gave up the first goal. They went in at the half trailing 1-0, but came out fighting in the second half, scoring twice in less than two minutes towards the end to take the lead, before Richmond equalised in injury time. 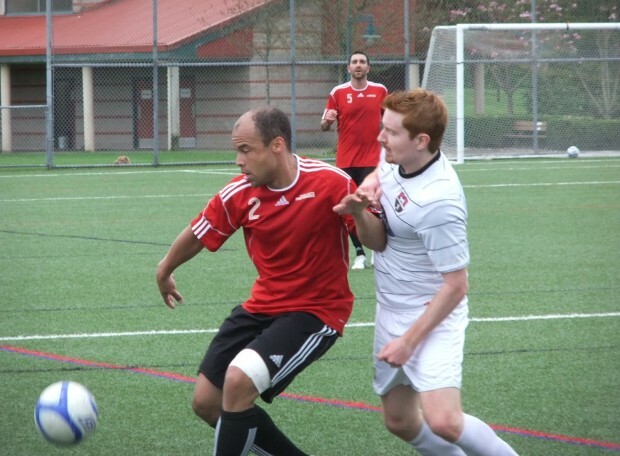 Goals in each of the extra-time halfs ended the run of the All-Blacks, and the Coyotes advance to the Men’s B Provincial Cup Final and a match-up with NVFC Campobasso. It took five minutes for Surrey to settle down, as Richmond applied pressure that led to the first chance of the match when Brett Sanderson got free inside the box but fired the ball over the bar. After the initial pressure the Coyotes started to carry the play for the next 30 minutes, but their shots either missed the target or were handled by goalkeeper Peter Procter. In the final five minutes, and against the run of the play, All-Blacks’ Brian Tonaka crossed a ball into the box which was side-footed home by striker Daniel Tait to give Richmond the lead. In the final moments of the half Tait had a couple of opportunities to score a second but shot wide each time. The Coyotes came out of the break with a sense of urgency and they were able to muster multiple chances in the first five minutes, the best one coming when Kule Kambere used his pace to split two defenders in the box before his shot was saved. With 20 minutes to go Ethan Lowenstein came close to doubling Richmond’s lead when he unleashed a shot from 25 yards out, only to hit the bar. The final ten minutes saw a flurry of goals as Surrey FC pulled level after some great wing play was finished by Mandeep Sara. Less than two minutes later the Coyotes took the lead as Captain Terry Oujla sent in Chris Kyd alone and the striker made no mistake chipping the ball past the keeper. It looked as if the game was finished but a late flurry by Richmond led to the ball finding Glen Krizck at the top of the box and he fired in a bullet to force extra time. The extra time saw very few chances until the 104th minute when Surrey’s Adriano Negri found Kambere alone and the winger was able to curl a shot past a diving Procter. The Richmond side seemed to run out steam, despite using 27 subs compared to Surrey’s two, and they couldn’t generate any decent chances before Surrey FC put them away with another goal in the final minute. It should certainly be an entertaining ‘B’ Final between the Coyotes and Campobasso and the game is scheduled for a 3pm kick off on May 12th. It really is disappointing though that the ‘A’ and ‘B’ finals kick off times overlap. It would be great if they could be changed. The U21 final will take place at 12.30pm between defending Champions Victoria Highlanders, of the VISL, and Port Moody Gunners from the Fraser Valley league. 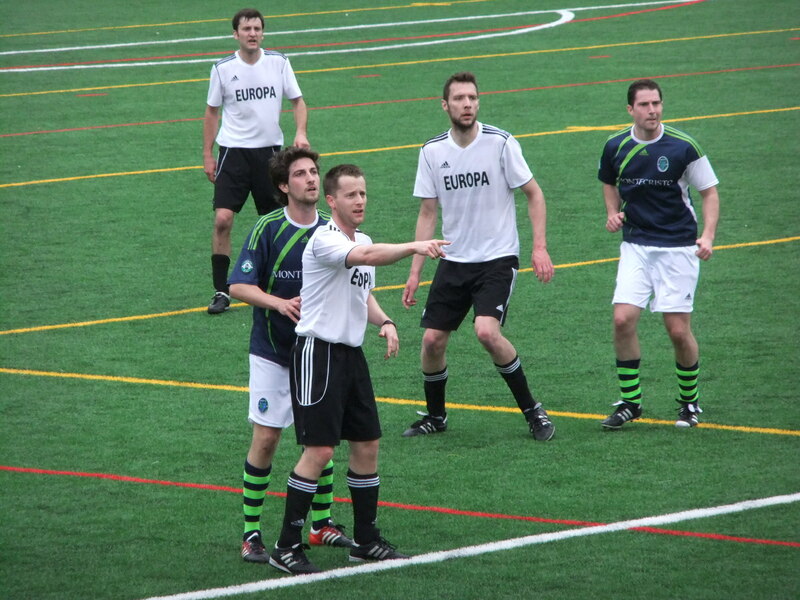 The Finals afternoon kicks off at 11am with a Masters Final between two VMSL sides, Westside FC and West Van FC. Good luck to all of the teams playing in the finals. There should be a feast of football on display that day, and with the Whitecaps away to New England (with a 4.30pm PST kick off), it would be great to see as many people as possible get out to see some of the action, and if you PVR the game, pretty much all of it!